Sunglasses Day is on the 27th, and we’re celebrating with a free Gift and a hashtag contest! Post a pic of you and your bestie wearing sunglasses to the Buzz with the hashtag #shades for your chance to win a pair of SKOUT sunglasses for you and your bestie along with 500 Points! In addition to posting a pic to the Buzz, be sure to give your favorite Skouters the Sunglasses Gift located in the Summer category of the Gift Store. Remember: This gift will be free all day! Happy Sunglasses Day, Skouters! Stay cool. Learn how to give a gift to a Skouter! Click here. You're Never Traveling Alone If You're Traveling With Skout! Summer has officially started, which means vacation season has too. While the saying is, "The more the merrier," traveling solo can be just as fun and even more meaningful. Not to mention you can do whatever you want, whenever you want. It's also the perfect opportunity to meet new people! If you're in an unfamiliar place by yourself, you are more likely to ask for the help of others. Travel journalist Anisha Shah writes, "Traveling alone is no longer taboo. In fact, it's now trendy to go on trips alone, as more and more people are discovering the freedom of exploring a new place on their own terms. At the same time, community groups, meet-ups, and a vast wealth of online and digital resources have made it easier than ever to hit the road solo". Prior to your solo trip, why not use Skout's travel feature to ask for travel tips and make new friends in advance. Fodor posted the world's best destinations for solo travel, and we picked some of our favorites below. I’m not talking about a picnic, so no blankets. Just take off your socks and shoes, find a nice big patch of lawn somewhere, and sprawl out. Stretch every limb out as far as it’ll go, making sure to grab big fistfuls of grass when your arms have extended to the max. Roll around a few times, ideally at around three or four in the afternoon, the sun at that perfect forty-five degree angle of shine, while you think to yourself, I could fall asleep here, seriously, why don’t they make beds as comfortable as they make this lawn? This particular activity is best enjoyed right now, these very first few days of summer. After a wet spring, the grass is finally soft and full for the first time all year. And since it’s still early in the season, the infinite broods of mosquitos and beetles have yet to really assert their presence to the outside world. Enjoy it while you can, because summer only gets hotter, and the grass is never as green as it is by the end of May. Maybe I’m crazy, but I feel like if you plan a picnic anytime past mid-June, the whole event invariably winds up getting overrun by bees. But much like my earlier point about mosquitos and beetles, the bee population just hasn’t had time to populate the area, let alone strategically plan out ways to circle all of your beloved picnic foods en masse. But picnics are about so much more than food. It’s a great opportunity to play all of your favorite lawn games. I’m talking Can Jam, Corn Hole, badminton and croquet. Basically anything that’s really easy to set up and only involves one hand to play. I could play outdoor games for hours. I know that you can buy watermelon all year, but it’s something that you have to go out of your way to look for off-season, and it’s never really the same. Not like it is early summer, where every aisle of every supermarket is something like fifty percent stocked with watermelons. They’re everywhere, pre-sliced, cut up into cubes, blended into smoothies. But trust me, the best way to eat a watermelon is whole. Even if you only do it once a year, it’s one of the most enjoyable methods to consume fruit. Buy the watermelon, put it in the fridge, and go out for a long run. Don’t bring any water with you, and make sure that you push yourself just up to that point where you feel like you might be in danger of passing out. Then come home and eat the entire watermelon. Eat it with a spoon. Slurp up the watermelon juice when you find yourself staring at an emptied out rind, asking yourself, did I really just eat a whole watermelon by myself? You did, and it was amazing. Wait until around two or three in the afternoon and then hang out on the corner of the local public middle school. OK, you know what? That came out wrong. Go to a park, take a walk past the a busy baseball or soccer field, or if all else fails, just sit by the front of your house with the window open, listening for that faint but unmistakable music-box melody, the Mr. Softee song. Slurpees are OK in a pinch, and I guess the pizza store Italian ices will work if you really can’t find a truck, but Mr. Softee is the preferred way to ring in the summer. When it’s your turn on line, trust me on this one, don’t go for anything fancy, not yet. There’ll be plenty of opportunities later in the season to go for the milkshake or one of those Incredible Hulk popsicles with gumballs for eyes. But for the first Mr. Softee of the year, just get a classic soft-serve cone. One lick and I feel like I’m a little kid again, like I’m hanging out with my grandfather and he just bought me a cone. If you really want to get into it, make sure you get ice cream all over your shirt and face, but your mom’s going to yell at you for making such a mess when you get home. Everybody always talks about playing basketball. At least, that’s what it was like for me. Every year around this time, all of the guys would start paying lip service to getting together at the park and running fives. But it can be intimidating, showing up at a court, everybody else is already playing, there are all of these unwritten rules and etiquette that everybody there already just kind of knows. Just grab four friends, make plans to show up, and if the court is already packed, if the sidelines are brimming with people waiting to play, start asking, “Who’s up next?” Eventually you’ll be up, and even if your first game is anything like mine was, like a total blowout, just hop back at the end of the line and wait for another go. You’ll get better, and if you make basketball a regular thing, you’ll meet people and make friends. Plus, the Mr. Softee guy always shows up at the basketball courts, so it’s a win-win. Summer time always makes me want to purchase new, cute sun dresses. Of course, sun dresses normally have a short wearing season, so in order to maximize the investment I've rounded up 7 Summer Frocks that will transition right through fall. The best part about them is you get the instant gratification of wearing them now, and the budget friendly knowledge that they aren't just for summertime. Catch the space age trend with the My Moon My Plan Dress in plus size. It's cool enough for a summer evening spent under the stars and when those days start to get shorter and the nights longer pair it with black leggings and kitten heels for fall worthy feel. Try your hand at mixing patterns, florals and space age blend beautifully on the Cosmic Bloom Dress. The mesh top keeps it summer time cool and when the flowers stop blooming through on black stockings and boots to keep summers blush through the fall. For a casual, and cute look the Tabby Road Dress can't be beat. Cats have gone viral these days so show your support with this easy shift during the summer months and when fall comes cozy up with a cable knit cardigan and tights. Stay with the maxi trend this summer in this Marrakesh Maxi - color blocked and striped. Perfect for throwing on after a day in the sun to keep the evening chill at bay, add a chunky knit cardigan and boots for a snuggly fall feel. Blooming buds continue to trend for summer and when paired with optic black and white stripes the effect is stunning. This Floral Dimension Dress is made for flip flops or strappy sandals in the warmer weather and electric blue tights with black heels as fall settles in. Staying with the optic trend try a strapless like this Fast Forward Dress for summer dance parties. When chillier weather hits, add a shrunken cardi, pearls at the neck, and black patent heels for an evening soiree. Color blocking as a trend, is sticking around so embrace the look with this easy Love Shift Dress. Throw it on for an easy summer brunch, add knee high boots and a sweater for a day at the office this fall. Have an event or fashion question? I'm here to answer them so leave a comment! Summer is in full swing and so are outdoor concerts. Here in San Francisco we have 4 on Friday alone. So what to wear to an outdoor concert that keeps you looking cute, a little boho and comfortable? Never fear Skoutinista's got you covered. 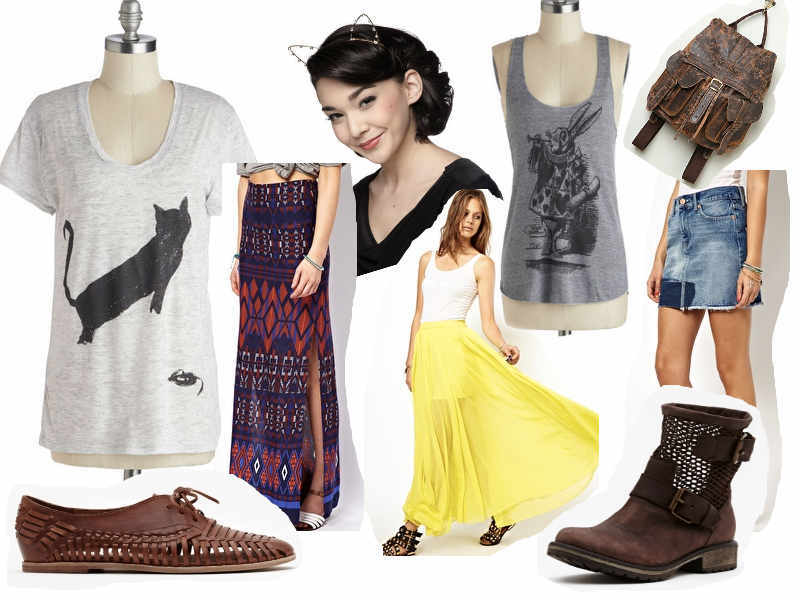 Check out my picks for a bohemian feeling concert look. Graphic Tee's and tanks are perfect for a casual yet stylish concert top. Pair it with an on trend aztec printed maxi skirt or flowing sunshine yellow. Feeling more like a mini? You can't go wrong with a summer staple, denim, in a patchwork skirt. Concerts require standing, and lots of dancing so be sure to wear proper foot attire. Toes covered for protection flats or boots add the style element. Last but not least throw on a backpack for toting the VIP pass, your wallet, sunscreen and hoodie for when the sun goes down. Add your own sense of humor with a whimsical headband and get ready to dance the day, or night away. Got an event, party or just wondering what to wear to meet friends for drinks? Leave me a comment and I'll style you up. So this week I had a Skout member ask how they could surprise a guy...well, we must be on the same wavelength because this question falls right into what I was planning on talking about. Summer is here and the time is right for…sure, dancing but so many other things too. A great way to surprise your guy (or girl) is to plan a date, start to finish and I'm not just talking your average go to dinner type evening. In relationships usually one partner normally takes the lead on organizing what to do and where to go, so why not surprise your significant other by taking the lead this time. Instead of just heading out to dinner think out of the box and keep the awesome summer weather in mind. Wondering what to do? Never fear, I’ve got a few ideas that you can use in entirety or parts of…it’s up to you, just make sure you’ve got it organized and have fun! Take advantage of warmer evenings and enjoy some outdoor entertainment. Cities across the world host outdoor movie nights and concerts...most that are free! In Los Angeles, CA on Friday evenings LACMA hosts free jazz in the courtyard. Pack some snacks, beverages and a blanket and you good to go. Fancy a show? Try a drive in movie sans the car. In New York City you can catch a flick showing on the big screen in Bryant Park or on the piers in Lower Manhattan. Whether you choose a self-guided or led tour wandering your own city can create lasting memories with new friends and partners. In San Francisco a stroll through China Town offers a unique glimpse into the history of the city by the bay, and the best part...you can end the tour at the fortune cookie factory and see what your future holds. Sometimes summer weather, as wonderful as it is, can drive us inside to escape the heat and humidity. Plan a cool afternoon or evening with a lighthearted competitive edge, at the bowling alley. Those hipsters have helped bring back a vintage style pastime, and added a cool edge to it. Places like Brooklyn Bowl in New York or Lucky Strike in Los Angeles aren't just bowling, they are an experience with ambiance, music, full bars and snacks other then microwaved nachos. Make a day or evening beach time! Pack snacks and sand castle building equipment to build your dream house together. Watch the sunset, keeping an eye out for the green flash while you enjoy the warm weather, salt air and soft slap of the waves on the beach. Look, anyone can order a drink at a bar, or make reservations at a restaurant, planning something out of the ordinary, taking into account the weather and what the other person likes to do shows at the very least interest on your part, and even better, a desire to try. Most of these activities can be found in any city, but if you don't have say a beach substitute a park, or if you don't want to go bowling maybe head to a ping pong club and play a few games. The point is, don't take the easy way out, plan something out of the box, keep it under wraps and surprise your date. Most importantly don't forget to have fun! Have a specific question, leave it below in the comments and I'll get it answered. JUne 20th marked the official first day of summer and to celebrate our favorite season Skout had a work from pool party day! While this is super awesome it also brought up a few questions for Skoutinista, most importantly what to wear for a "work" pool day. Because let's face it, what you are going to wear to the pool at the Raleigh in South Beach or The Rooftop at the Standard Hotel in LA is definitely different then what you want to hang with coworkers in, well hopefully it is. So check out these pool party basics, that do double duty-lounge away and answer emails to your hearts content. Don't feel like wearing a bathing suit,no worries, try a strapless romper or maxi dress. Both keep you cool with no strap lines while hanging by the pool. Wether you are cooling off in the shallow end of the pool, or taking turn on the water slide, try a simple black bikini, or a patterned one piece for cool but appropriate look (leave the brazilian cut at home-your coworkers don't need that image). Don a cowboy hat to keep your face shaded and ease squinting at the expense report. As the afternoon sets in pop on a white tank and cutoffs over your suit for a relaxed and comfortable brainstorm. Last but not least keep your feel from getting to toasty when you get up to grab a drink with a pair of cute flats. Got a party and don't know what to wear? Leave a comment or chat me up on Skout and I'll find you a head turning ensemble!